When I heard through People Friendly Stamford that there was an effort underway to get rid of a bike lane in town, my first thought was: "There's a bike lane to get rid of in the first place?" Yes, in a city that needs to start adding on-street bike lanes by the mile if it has any hope of keeping young people from moving away and any shot at calming traffic, there is a public hearing scheduled on January 7, 2014 on the 4th floor of the Government Center (in the cafeteria). 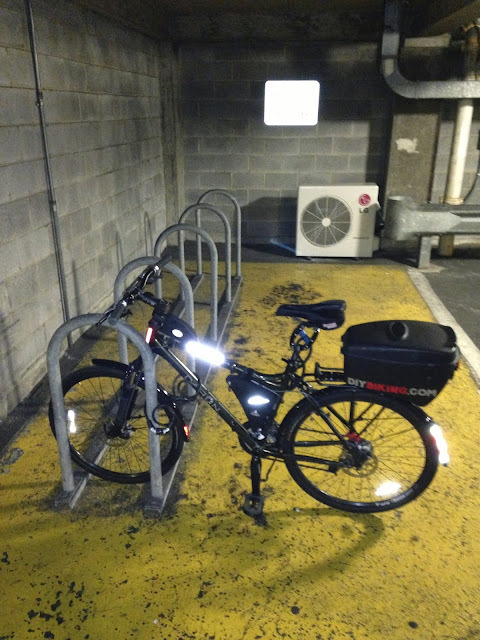 Bike parking is available in the Government Center/888 Washington Boulevard garage, just near the entrance (that part wasn't in the public notice - that's just my little FYI). The picture at the top of this post came from the original Bike Stamford ride in October, which illustrates the bike lane's usual state. Apparently, residents at a building at that location have petitioned the city to eliminate the bike lane to allow residential parking by permit. For $10 a resident can buy an annual permit and have six visitor permits to give to guests. I sighed when I read that part of the public notice. From time to time, in my neighborhood, this issue is brought up and I come out against it every time. I know people who support the permit mean well, since they mostly want to keep drivers from parking their cars on the street and then walking to the beach, but it would likely be so sporadically enforced it would be more likely to snare my parents when they visit from Mystic or my friends who visit from New Hampshire and forget to hang the permit from the rearview mirror. Also, since the bike lane in question is so close to the Transportation Center, I can just imagine friends of residents who work in New York City begging for a guest permit they'll be able to use to avoid paying for parking. Now I'll admit I don't know all of nuances of the Washington Boulevard permit holder thing but I'm willing to listen to their side of it at the hearing on January 7th. I own a 3,300 pound SUV and with no driveway or garage, I have to park it on the street where I live. My wife and I have arranged our lives as such that we only need that one car between us (I'd like car taxes to change to reward families that do things like that, but that is another story). To learn more about the issue, I went off yesterday to park at Exhale, where I take yoga classes (and I urge all men to do so: not only do you get to be in a room full of beautiful women once a week, but I recently changed the faucet in my kitchen with the aid of enhanced flexibility and tightened the cold water valve with the help of a sphinx pose). But that's off the subject. At first glance, I saw eight cars parked along the snow-covered street. Two of the vehicles - one battered, the other with a broken windshield - obviously hadn't been moved in days. I sometimes don't use my car for days at a time myself, so I didn't judge. I brought along my Measure Master, which I used when finding out the distance between the Stamford parking garage and the station a few months ago, and decided to see how long the stretch was. From driveway to driveway, the bike lane in question is about 278 feet long, which provides room for about twelve cars. Dodging traffic, I measured the width of the road as well: almost 38 feet on both sides. I also noticed a car with Florida tags parked in the lane just near the 'NO PARKING ANY TIME' sign. I'm not defending that behavior, but when you're in a car and you see visual cues of street parking (in this case, outlines of previously-parked vehicles in the snow) you may not know there's a bike lane there at all. A problem on multiple levels. At home, I built as close a scale model as I could of Washington Boulevard. In case you're wondering, the HO models I have are 1:87 scale, so a little bit of arithmetic got me to a layout that hopefully captured all of the nuances of that stretch. Looking at what the street looks like from the above, I realized there isn't a bike lane on the other side of the street. Stamford truly is the unfinished Death Star of cities - except in this case, all systems are not operational. It would be welcome if there were lanes in the other direction, if not sharrows (for those of you who may not know what sharrows are; here's an illustration). Now imagine if space was given for bicycles (on the road and with parking) and four of those people came on bikes instead. Bicycle infrastructure is not for the spandex-clad few, it's for the traveling many. 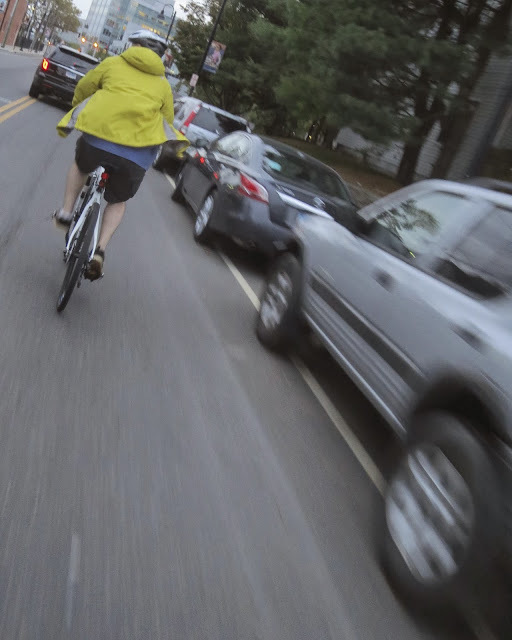 I hope to see every Stamford cyclist at the hearing, and in the meantime, please take the Stamford Share the Road survey and tell your friends in town to do the same. Thanks for reading and thanks for riding.